With the term over, I finally had time to look back at some of my photos (and papers). Here are some shots from the lovely workshop on "Natural Kinds in Philosophy and in the Life Sciences: Scholastic Twilight or New Dawn?" The title is a reference to a recent screed by the famous philosopher of science Ian Hacking called "Natural Kinds: Rosy Dawn, Scholastic Twilight". As the title suggests, Hacking thinks that philosophical research on natural kinds has entered a period of scholastic navel-gazing. I have two (conflicting) reactions to this. (1) No it's not! (2) He's wrong to think that it ever wasn't (in at least some sense) — it's just that our navels were previously out of focus. Right now, I'm more inclined to the second interpretation, no doubt partly because I'm busy writing two books on natural kinds! Fortunately, Hacking's arguments are pretty uncompelling. "Cell Types as Natural Kinds"
It feels like just a start. But that's okay. I'm already way over the word-limit. And I'll definitely be coming back to these issues when I'm able to get back to writing my book on Biological Kinds. In the meanwhile, I'm all about species! Got a June deadline to worry about. . . . Anyway, while at the conference, enjoying spectacular weather — I stayed a few extra days because I had a Tuesday/Thursday teaching schedule and I could — Lewisburg saw the worst flooding since the catastrophic 1972 Agnes flood. Bloomsburg, about 40 minutes away, was really devastated: like roads/bridges washed away, homes floating down the Susquehanna River, and so on. 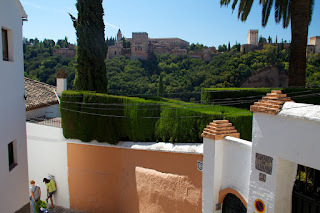 So between checks of the hydrological survey online and Facebook updates of emergency basement clearings — our house, being on a hill, was unaffected —, I was touring the Alhambra. Bizarre. I missed the whole flood visiting a parched country.